Need a moonlight? This is your answer! The kit has everything you need for tanks as small as a 3 gallon pico, all the way up to a 96" 400 gallon. Simply cut it to length. Comes with silicone coated water resistant flexible LED strip with 3M adhesive backing. Comes complete with a 24 button wireless remote control (16 selectable colors, 8 different intensities). It also has it's own power supply so that you can put it on a separate wall timer (yes this moonlight has memory, it turns back on with the same setting that it was turned off with). Simply select the moonlight color for the night based on your mood, your fishes mood, the weather outside, etc. Want to impresse someone with nighttime viewing? Turn it solid BLUE. Want to catch that difficult to catch fish with a simple dipnet without it hiding in fear, wait until night and turn the lights RED -most fish can't see red light! Want to calm newly introduced fish in the tank - turn the lights to a comforting CYAN. Want to simulate an early sunrise or late sunset - turn the lights amber. Want to simulate deep ocean depths - turn the lights purple. Don't confuse this with the cheap knock-offs sold by Amazon, those are flimsy, comes pre-yellowed - not clear, corrodes easily and the adhesive is messy. 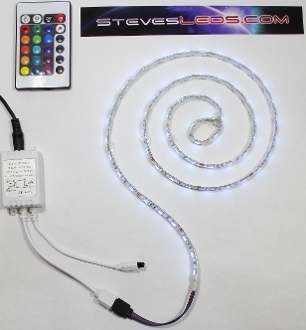 Steve's LEDs uses a high quality 3M adhesive and corrosion reisstant encapsulation that doesn't yellow over time. This is the real deal. Steve's LED's Moonlighting Kit Is AWESOME !!! I have a 29G Oceanic Bio Cube. I did not have the power supply that drives the 3 LED moonlight kit in the older Bio Cubes. I found the cord online for 20 bucks. Then I stumbled up on Steve's LED's Moonlighting Kit. For a measly 24 bucks you can replace the 3 LED moonlight that comes stock in the bio cube's and you will be amazed !!!! Not only can you get the single darker blue like in the biocube but you can get a lot more colors to choose from. The handy kit even comes with a remote control and a power supply that comes with an expansion port on it to add another strip. So with that being said , this is a superior product that is needed in any tank with lighting needs. Way to go Steve's LED's !!!! The reason I only gave it a 5 Star was because there were no more stars. The LED moon light system worked perfectly out of the box. Shipping was really fast and arrived the same week I ordered the item. I found turning down the blue LEDs to their lowest setting worked great. I mounted the LED strip in a 36 aluminum angle iron (3/4 x 1/2) for support. The only negative is the power cord is a little short. A one meter 4-pin LED extension cable connector resolved the issue. Are you frickin' kidding me??? $24 bucks? I would have paid double...easy! These moonlights have NO competition or comparison. They work flawless, they are super bright, they are totally adjustable and color changing if you like, and to top it off it comes with a super cool wireless remote! So you miss out on a couple of trips to Starbucks...BUY IT!!! Best money I've spent on my tank in a long time! It would be a mistake not to buy! This led system is hands down the best you are going to get ANYWHERE for this looow price! It works flawlessly; not a single flaw and that is unusual nowadays... The moonlighting is perfect and can be adjusted to any intensity; the lowest is a perfect moonlight. It is also great for added light and ambience in your tank or anywhere else in your home!!!! and is expandable for an additional strip and acc... Buy with confidence for sure! A superb and fun addition to my tank! I bought this moonlihgt kit for my 30 gallon nano cube marine tank along with one of Steve's LED retrofit kits. Installation of the moonlight kit couldn't have been easier and the lighting works and looks great. The only complaint involves the adhesive used on the led strip- it starts to let go after a while, so have your hot glue gun handy. Length - ~1 meter (40", 3.2 feet) This is bright enough for a 400 gallon tank, remember you can cut it to length or reduce its intensity via the remote control. This is a universal lighting system. Stick one in your tank stand to light so you can see your storage area better. Makes for excellent ambiance lighting around your home. Place it on top of bookshelves and cabinets for an amazing effect. We have used this as counter-top lighting in kitchens by installing it to the underside lips of the cabinets above the counter top. Very bright! You could use this for tiny refugiums, but it won't grow algae as well as our refugium kit will.